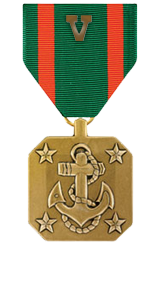 For heroic achievement in the superior performance of his duties while serving as section leader, Heavy Combined Anti-Armor Team, attached to Company I, 3d Battalion, 3d Marines, Combined Joint Task Force-76 from 8 November 2004 to 15 May 2005. During this period, Sergeant Toms significantly contributed to combat operations in support of Operation ENDURING FREEDOM in Afghanistan. His form of leadership played a significant role in the unmatched success of Company I in their area of operations. Serving in a challenging billet usually reserved for a Staff Sergeant, Sergeant Toms’ expertise went far beyond that of heavy machinegun employment and combined anti-armor concepts. During an enemy engagement on 24 December 2004, Sergeant Toms effectively employed his section, suppressing the enemy, allowing the dismounted forces to close with the objective area. His actions served as an example to all and embody and exceed the professionalism expected in a Marine Sergeant. Sergeant Toms’ initiative, perseverance and total dedication to duty reflected credit upon himself and were in keeping with the highest traditions of the Marine Corps and the United States Naval Service.